I can't explain it, but I love office supplies! I've been doing very well lately, keeping my acquisitions in check, but a few weeks ago I got a $10 off coupon from Office Max I only had to spend $20 and they'd give me $10 back, so I figured if I did it right, I could get a 50% discount on something I've been coveting. So what did I decide on? A long reach stapler....a long reach stapler, what's that you ask? It's a stapler that lets you staple up to 12" from the edge of a page or a better way to look at it is, I can now print a "booklet" on 11"x17" paper and staple the middle of the pages like a real book! I know I'm a dork! Oh yeah, and I also got a "retractable" hi-lighter, but the only problem is, I can't think of the last time I actually used a hi-lighter...but hey it was cool and there's no cap to lose! My kid needs the retractable highlighter, she never gets the lid on good. I WANT that stapler. Not sure I'd ever use it, but damn, it's cool! I would use a retractable highlighter every day!! I am totally in love with office supplies too.. it's like staples is to me what disney world is to everyone else. heh. Andi - Don't give me any ideas!!!! OMG - I love office supplies..and guess what...I worked for an office supply manufacturer before TBF and I moved to Basel. 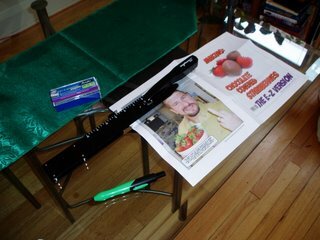 And, if I'm not mistaken (it's hard to see because I can't make the photo bigger for some reason)that's a Swingline stapler you've got there...the very company I used to work for made and owned the Swingline brand!!! Dottie Jo - Thank you for stopping by. I hope you come back and visit often!